Copper and crew celebrating a successful Terry Redlin hunt. 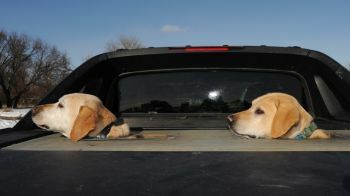 Copper and his son Gordy after a day of hunting. Too long in the tooth for running and playing any more. To paraphrase Ecclesiastes, there is a time set for everything, a time for birth and a time for death. He sets the time for mourning and the time for dancing. Unfortunately, my old friend Copper has seen his last dancing, his last retrieve, and now it’s time. When you're born you've begun to die — the trick is to put as much space between the two events as you can. With a new puppy it's the same story, just less space between. 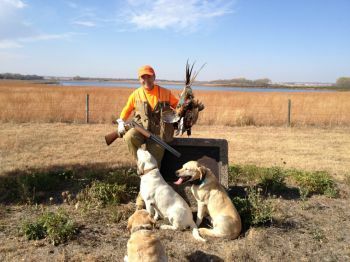 With a hard-working hunting dog, the space is even shorter. Ten or 11 good years is a good run through the winter sloughs and fields up here on the Coteau. Copper came into our family in a picnic basket with a red bow on it for my daughter Erin's 12th birthday, a cute, lovable yellow lab puppy. Copper's bloodline came from a bait shop in Browns Valley, Minnesota, the last available of a litter of a hunting buddy's buddy's dog. Kind of an inauspicious way to start a decade-long journey as the best hunting dog that ever owned me. Copper was never a housedog. He lived in an outdoor kennel on our place his whole life. For 12 years Copper and I have shared his morning and evening constitutional and feeding. In the early years these 20 minutes together twice a day were school time, but the smart ones learn quickly. Copper's first fall was at six months, and before Christmas he was a hunting guy’s best buddy afield. With great ones you don't get many memorable stories because performance in the field is the norm. 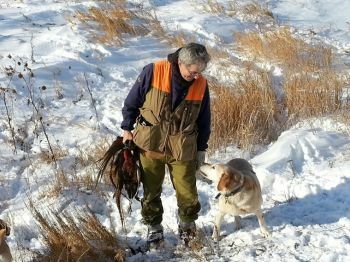 Copper lived for flushing roosters out of cattails in waist-deep snow in the sloughs of the Coteau. He'd hunt all day and only give up when the shotguns were emptied and he'd nestled into the straw in the back of the Avalanche at day's end. But I can remember one great (and unfortunately tragic) performance in Copper's life. 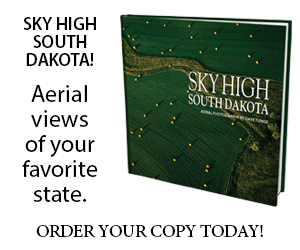 It happened on the Missouri River breaks. Copper was working a line of three of us up and down the rolling hills of the river breaks when a rooster flushed high, sucked the wind and was heading for freedom over a hill and a cattle fence to our right. Just on the edge of range my buddy hits the ringneck, clearly wounding it, but leaving it with enough power to coast over the hill, and the next one, into a pasture of large bulls. The bird came down a good quarter mile away, but Copper was on it. We watched Copper go over the first hill, under the fence, and over the next hill cleanly on the bird's line. But he was also heading into a crowd of very large Angus. We saw Copper run the bird down, grab it, turn and trot back towards us, with about 15 Angus bulls gaining on him. When we lost sight of him below the first hill, I was pretty sure the herd had just trampled the best dog I had ever owned. After a few minutes Copper popped over the hill, bird firmly in grasp, trotting at a good pace with the herd still gaining. Like it was just another day's work, Copper popped under the fence, left the bulls in the dust and dropped a beautiful rooster at my feet. Richard Nixon said that you can't appreciate the greatest heights unless you've experienced the greatest depths. Ten minutes after we celebrated that amazing retrieve, Copper came up lame and never hunted with four good wheels again. Copper's had a lot of great days in the field. His picture popping out of the hole in the back of my Avalanche has been celebrated in published hunting stories and social media. But those bookend events on the story of his life have gotten very close together. He hasn't hunted for two seasons and he really can't get around very well any more. He sounds like a three-pack-a-day smoker when he breathes. He still smiles and lights up when he sees the Avalanche getting loaded for the field, and his memory is filled with enthusiasm for the hunt, even if his body says he can't go along. When you get a dog, you know this day's coming. You just wish for that one last season, one last hunt, that last flush and retrieve, that last stand on the South Dakota prairie. Great story! A good dog is a best friend to many of us! most domestic animals specially dogs and cats become part of a Family, and when the end is near, the loss is just the same as losing one of your own. sounds like he had a good life. Always like to read stories of a Mans Best Friend ! 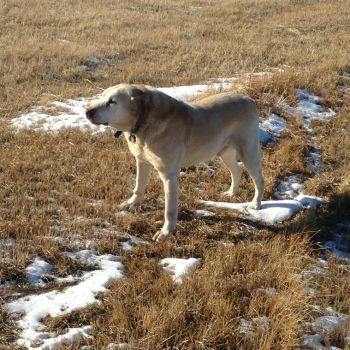 The loss of a loyal companion and field partner is a tear jerker for those of us who know what it's like to have a really good dog. I thought I'd never get another one that would hold a candle to the black I lost a few years ago. Garth Brooks put it best....."I could have missed the pain, but I'd have had to miss the dance". before I get in the recliner. Many years, ago; Bill Tarrant - then Gun Dog Editor, of Sports Afield magazine, wrote an article about the great English springer spaniels of Tom Ness' Oahe Kennels, in Menoken, North Dakota. I knew of Tom, from our old amateur boxing days, and was fortunate enough to get one of those dogs. She owned me for the next 14 years. Pheasants, sharpetails, Huns, ducks - she didn't care which. As the dearly departed, Bill Tarrant, often wrote: In our lifetime, we might have one really great dog!